Format Factory is all in one audio, video and image file converter. Use drag & drop, crop, split and merge features and also enjoy pre-made profiles. Its an ultimate conversion tool which is completely free. 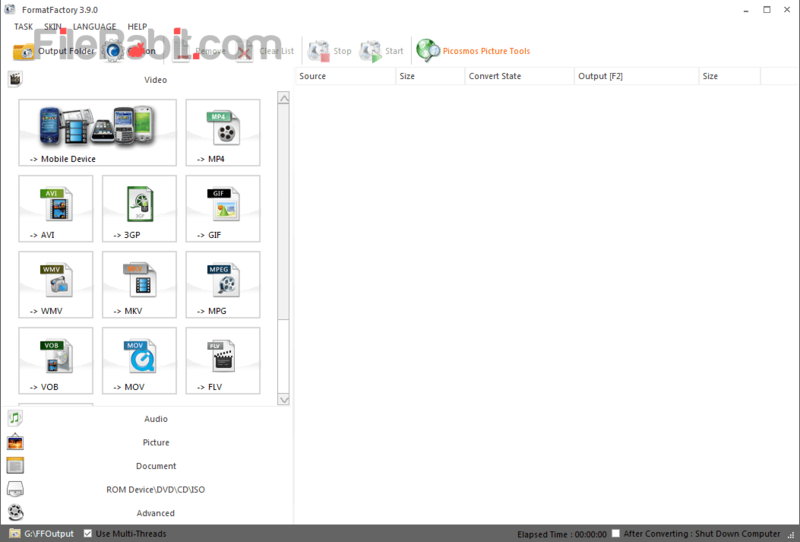 Format Factory is simple, fast and powerful multifunctional multimedia converter that covers almost every file format. The internal codecs and decoders will quickly convert any input file into any target output file. Sometimes video files were corrupted so we can’t play them. FF can read the internal streamline of those videos and also can convert into target output file in viewable shape. Many HD/HQ videos have more size and we can’t play in smartphones before conversion. Format Factory will automatically decrease overall size, resolution and quality to play in mobile phones. The latest version is more featured and powerful because it can earn access to ISO/CD/DVD/ROM Device. Customizing output folder is easier and by default, it will save at same as input file location. Audio Conversion: It covers all to MP3, WAV, APE, MP2, M4R, M4A, MMF, FLAC, OGG, WMA, AMR and ACC conversion. You can even convert a video file into audio/music file extension. The quality of target file will be depended on custom configurations e.g. Medium, High or Low. Video Conversion: Multimedia video conversion is an awesome feature which allows ultimate control over wedding, picnic or birthday party videos. Just convert 3GP, MP4, WMV, AVI, FLV, MPG, SWF, MKV, MOV, RMVB and more. You can use different codecs e.g. XVID, MPEG4, DIVX, AVC etc. Picture Conversion: Converting different images/graphics/pictures into different file extensions is now easier and faster than ever before. It covers wide variety of PNG, ICO, GIF, TIF, TGA, PCX, JPG and BMP. Add multiple file into format factory queue, start conversion between any of supported file and see output folder. Rotate, zoom, flip and tags are supported. Advanced Tools: Join multiple videos into one, join audio files into single, Mux multiple audio and videos files, get complete media file information or rename dozens of files with simple clicks. However, add watermark to personal videos or tutorials to show copyright information. Mobile Support: Format Factory gives ultimate mobile device support that covers BlackBerry, iPhone, iPad, PSP, Android, PS3, Nokia and Microsoft devices. Just choose your own smartphone, select output profile with custom resolution, video size, FPS, bitrate, watermark, and more features.